Cpl. 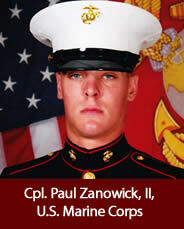 Paul Zanowick, II, U.S. Marine Corps, age 23, of Miamisburg, Ohio, died June 3, 2011, in Karim Karez, Helmand province, Afghanistan, while conducting combat operations. He was assigned to the 3rd Battalion, 4th Marines, 1st Marine Division, I Marine Expeditionary Force, Twentynine Palms, Calif.